This modern entertainment center puts your TV at the center of attention while providing you with an abundance of enclosed storage all around. Wall unit features a symmetrical design that perfectly complements any contemporary or transitional decor and space as well as lending itself to the new sleek, flat TV designs popular today although traditional tube and non-flat televisions can just as seamlessly be accommodated. At the center of this entertainment center lies the TV cavity with component shelf below. This area features an open back, making cable management easy! No more hassle getting your wires in and out and for proper heat ventilation for your cable box, DVD & Blu-ray player, home theater surround sound system, game consoles and any other equipment that you need to properly store and easily connect. The side cabinets to the left and right of the TV each feature 4 wood shelves, perfect for books, picture albums, accessories or any other items you want accessible yet not visible. There is even more space for your belongings with the 2 pneumatic flip-up doors above the center cavity for added light storage. Finally, 2 oversized utility drawers with full extension ball bearing drawer slides are at the bottom center of the unit, perfect for your CD and DVD collection and anything else you need readily accessible. 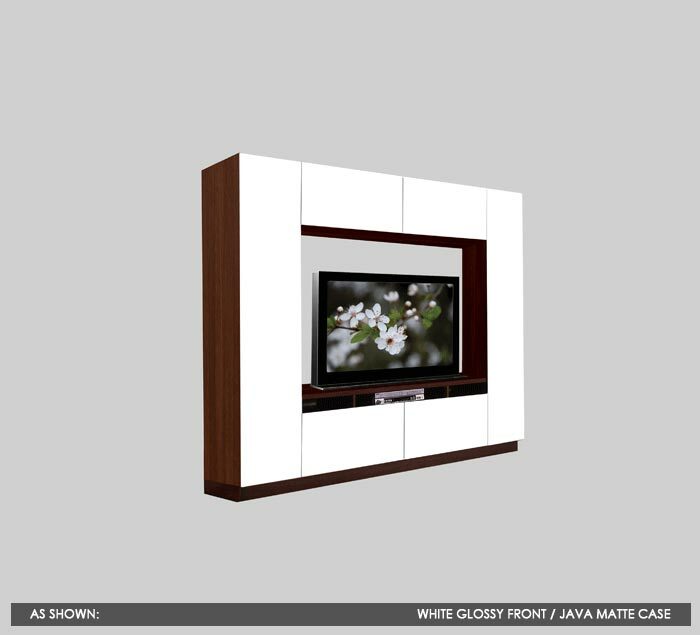 This entertainment center is available with in-home delivery and installation. The total home installation includes unwrapping and appropriately placing and installing the wall unit in the desired location, as instructed by the customer. Each furniture component arrives preassembled and is then attached together in the final space, making it one seamless, sturdy wall unit that looks built-in yet just as easily can be moved tomorrow. Packing materials will then be removed from the space and returned to us for recycling, leaving the only thing for you to do is to place your belongings and enjoy. 1 Dimensions may vary slightly from those listed. In order to accommodate these variations and make sure your purchase will fit during delivery, you must allow a 3 inch margin on all sides (width, depth and height). If your space will not accommodate the product along with the margin, then please contact one of our design consultants for a written proposal on a custom solution that can be more preciously tailored to your exact space and needs. 2 Finishes may vary slightly from those portrayed due to differences in monitors and how they portray colors. Swatches may have been enlarged or reduced to show texture and are not shown at actual size. If you would like to match a specific finish to your space and verify the exact color and texture, then please contact one of our design consultants to either make an appointment to come visit our showroom or order a swatch to be sent to you.